There are seven wonders of the Cuban civil engineering selected in 1997 by members of the National Union of Architects and Construction Engineers of Cuba (UNAICC). These works are unique due to their complexity, magnitude and applied techniques. We refer to the Albear Aqueduct, the Sewer Tunnel in Havana, the FOCSA Building, Central Road, Bacunayagua Bridge, the Havana Bay Tunnel and La Farola Viaduct. One of these is in Baracoa and undoubtedly, it was already identified by many just hearing the name. The oldest of all, the Albear Aqueduct, began supplying water in 1893 and today it continues to provide that service. In 1912 it was built the Sewerage Tunnel of Havana, designed to evacuate by gravity the sewage waters of the Cuban capital below the Havana Bay. The third wonder is the Central Highway, which is 1139 kilometers long, work that was completed in 1931. The FOCSA Building dates from 1956. It was built of reinforced concrete and it is 121 meters high above the street level counting with 39 levels. By that time it was considered the second world’s tallest reinforced concrete building. For the construction of the Havana Bay Tunnel it was required the use of innovative techniques. This work was initiated between 1952 and 1953 and it was opened in May 1958. And what to say of Bacunayagua Bridge! It is 110 meters high. It causes so much impression! At least that is what pictures reflect, but those who have passed over it know exactly of this feeling. And now, the awesome wonder of curves and slopes. 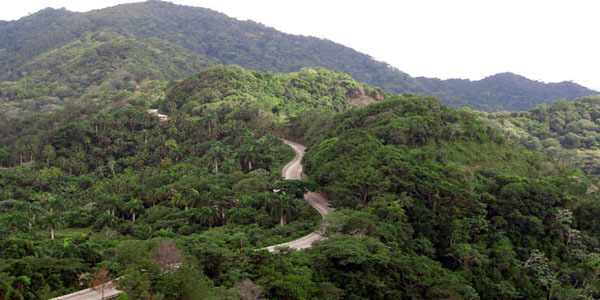 The last of the seven wonders of Cuba is located in the first of the seven villages. La Farola Viaduct. I know this very well! It is the road that links Baracoa with Imías, San Antonio del Sur and Guantanamo. In the construction of the viaduct the explosives could not be used due to the geological characteristics of the place. The pneumatic hammers faced themselves the many rocks of the lush mountains. La Farola reaches the 450 meters of height above the sea level and it was ready in 1965. This engineering work has so much magnitude that many of those who travel through it think they will fall into the abyss. To avoid the scare there are the stunning pictures with dense vegetation and beautiful mountains of various sizes with crystal clear springs that allow refreshing. Each one of the Cuban architecture wonders represents an achievement, and even more today when they remain preserved over time. Esta entrada fue publicada en News y etiquetada Albear Aqueduct, Bacunayagua Bridge, Central Highway, Cuban civil engineering wonders, FOCSA Building, Havana Bay Tunnel, La Farola Viaduct, Sewerage Tunnel of Havana, The last of the seven wonders of Cuba. Guarda el enlace permanente. La Farola, what amazing viaduct!, people travel along the mountains to get to Baracoa. It’s really amazing! Thank you for your comments. It´s a viaduct that really impresses me!